In my last post, I looked at the currency confusions that globalization has brought into financial analysis, and how to clean up for them. In this post, I discuss the other aspect of globalization that is forcing analysts to change long accepted practices in estimating equity risk premiums for companies. Taking what they have learned from finance textbooks blindly, practitioners have taken what they learned about equity risk premiums to emerging and frontier equity markets, often with disastrous results. Not only have they practiced denial when it comes to the additional risk that investors face in many markets, from political, economic and legal sources, but they have also considered risk by looking at where a company is incorporated, instead of where it does business. 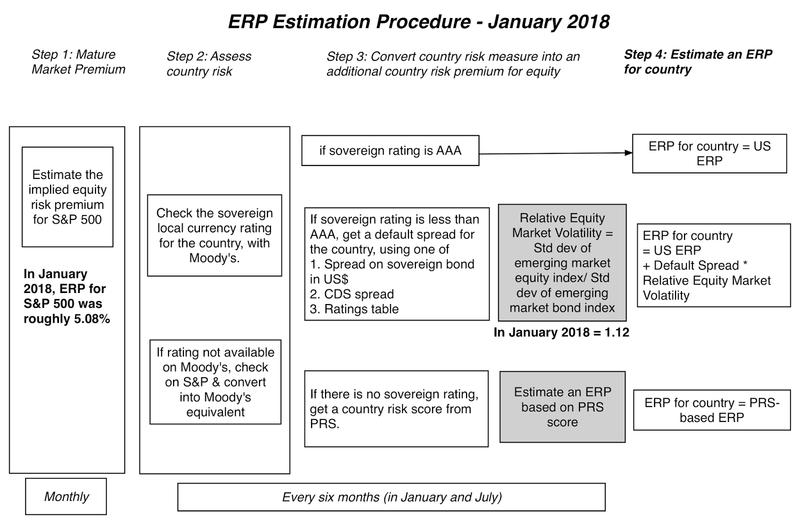 In this post, I will update my country risk measures for the start of 2018, and build on them to measure the equity risk premiums for companies. The more widely measured and accessible measures of sovereign risk are related to sovereign default, and as we noted in the post on currency risk free rates, there are three ways in which default risk in countries can be measured. The first is to use government bonds, denominated in US dollars or Euros, issued by sovereigns and to compare the rates on these bonds to a US treasury or German Euro bond rate. 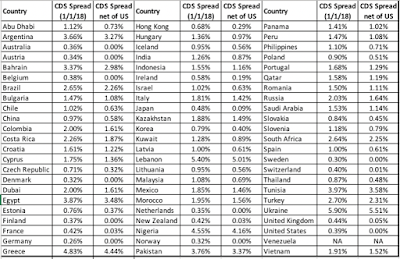 The second is to use the sovereign CDS spreads for countries, market-driven numbers, as default risk measures. The third is to use the sovereign ratings of countries as proxies of default risk and to convert these ratings to default spreads. Note that while there are clear differences across regions, with Latin America and Africa containing more risky (red) areas than Europe and North America, there are also differences within regions. 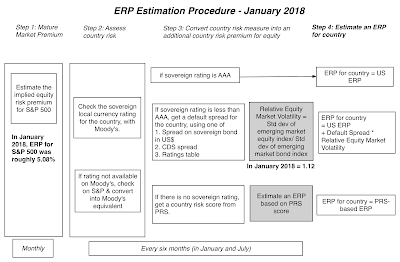 You can download the S&P and Moody's ratings, by country, at the start of 2018, by clicking on this link. 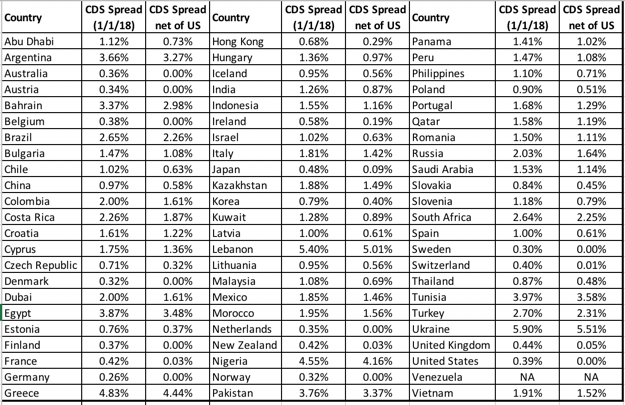 I don’t want to oversell these CDS spreads as better proxies of default risk. While they are certainly more dynamic and reflective of current risk that sovereign ratings, they are market numbers and like all market numbers, they are volatile and reflect market mood and momentum, as much as they do fundamentals. Sovereign or country equity risk measures are more difficult to come by than sovereign default spreads. First, there are services that try to measure the political and economic risk in countries with scores, albeit with no standardization. Second, the default risk measures can be converted into equity risk measures by scaling them for the additional risk in equities. The World Bank, Political Risk Services (PRS) and the Economist, among others, try to measure the total risk in countries. Those scores have no standardization and cannot be compared across services, but they still represent more comprehensive measures of risk than sovereign ratings or CDS spreads. 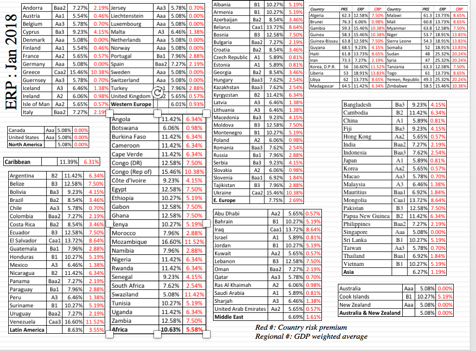 In the heat map below, you can see the country risk scores reported by PRS, with higher scores indicating lower risk. Comparing this picture to the sovereign ratings map, there are clearly overlaps, where the country risk scores from PRS and the ratings deliver the same message; Latin America, Eurasia and Africa remain high risk zones and European countries have lower risk. Using this approach does require traded government bonds, available for only a handful of countries. To generalize this approach, I use the ratio of the volatility in an emerging market equity index to the volatility of an emerging market government bond index, using the most recent five years of data. That ratio, which is 1.12 at the start of January 2018, is used to convert sovereign default spreads to country risk premiums. These country risk premiums, when added to the implied US equity risk premium of 5.08%, yield equity risk premiums for countries. The picture below summarizes equity risk premiums around the world. Finally, if you prefer the data as a table, you can download the spreadsheet with the data or my more detailed country risk premium dataset. A company cannot change its risk profile by delisting in one market and resisting in another: It is a common play for emerging market companies to delist on their "risky" local markets and to re-list on a more developed markets. While there are some good reasons for doing so, which can potentially increase value, like increased liquidity and transparency, one reason that does not stand up to scrutiny is that the company has become safer, just because of the listing change. A South African mining company that delists in Johannesburg and lists on the London Stock Exchange is still exposed to South African country risk, after the move. A company's equity risk premium should change, as its geographic exposure changes: In estimating the equity risk premium for a company today, we need to consider where it operates today. If we expect that geographic mix to change over time, as it usually will, the equity risk premium that we use in future years should reflect these expected changes. And yes, that will mean that your cost of equity and capital can change over time. Welcome to globalization! When multinationals assess projects, their hurdle rates should vary across geographies: When multinationals assess hurdle rates for projects, those hurdle rates should vary, depending upon where a project will be, even if the hurdle rates are estimated in the same currency. Thus, the US dollar cost of equity that Coca Cola should use for a Canadian beverage expansion should be far lower than the US dollar cost of equity for a Russian investment. It is a pity that accounting disclosure requirements have been so focused on trivial matters that have little effect on value and have not really paid attention to the type of information companies should be disclosing to investors on geographic operations. If, as the Chinese symbol (危机) for crisis suggests, danger plus opportunity equals risk, it is not surprising that the most risky parts of the world also often provide the most potential for growth. By demanding higher equity risk premiums for investing in these parts of the world, I am not suggesting that you hold back from investing in these risky regions, but only that you demand enough of a premium for exposing yourself to additional risk. After all, investing should never be bungee jumping, where you take risk for the sake of taking risk! in your ERPbymonth excel says, ERP(T12m) from 01.02.18. is 4,78% but on your main web page(http://pages.stern.nyu.edu/~adamodar/) still stands this --> Implied ERP on February 1, 2018 - 5.08% (Trailing 12 month cash yield). Please could you check this? Thank you in advance!